is a professor of history and archival studies at the University of Southampton. His latest book is The Culture of Food in England, 1200–1500 (2016). In 1440, a popular Lollard priest, Richard Wyche, was burned at the stake in London for heresy. An ad-hoc shrine sprang up at the place of execution and, in an attempt to excite greater devotion, the vicar of All Hallows in Barking mixed spices with the ashes that remained from the burning. The sweet smell this produced – the odour of sanctity – confirmed Wyche’s virtue. The London authorities struck back by turning the site into a dunghill: the stench of ordure was what should characterise the heretic. These smells might have been counterfeit, but they are indicative of a way of thinking about sensory perception that is quite unlike ours. To medieval people, moral and spiritual connotations were an integral part of the process of sensation. 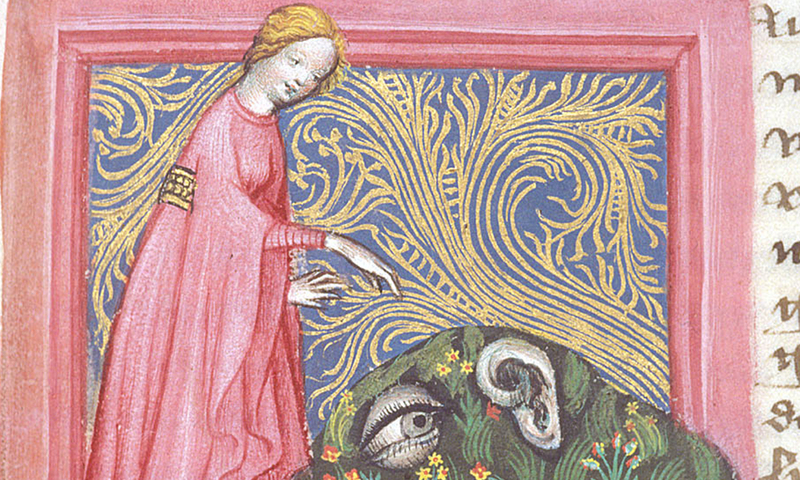 On the face of it, studying the senses in the medieval past should be a straightforward matter. Our bodies are ostensibly the same: there can have been little physiological evolution in the intervening period – and medieval men and women must therefore have been just like us. That, however, is to ignore an important aspect of perception: the way that we understand how the senses work is culturally determined. My experience when I look at something today is fundamentally different from how the people of the later Middle Ages saw it. Anthropologists such as David Howes and Constance Classen in Ways of Sensing: Understanding the Senses in Society (2014), and Howes in his edited volume The Varieties of Sensory Experience: A Sourcebook in the Anthropology of the Senses (1991) have demonstrated that different societies have different approaches to perception, and even different ways of sensing – and that is no less true for societies in the past. What has changed? The post-Enlightenment scientific world has a closed model of perception: the subject’s sense organs receive information, which is passed to the brain where it is interpreted. In the medieval world, perception was a more open process, where much might pass not only between perceived and perceiver, but also the other way round, from the perceiver to the object or individual who was the focus of perception. This was a two-way process, at the very least. Sitting at my desk today, I can feel that it is hard and smooth; it might also be warm or cold to my touch. If I had sat here 600 years ago, my senses might have transmitted to the desk physical, moral and spiritual qualities, and it might have passed others to me: if this was a place that had been used by a holy or evil person, those qualities might reside in the desk. This was not the one-way transmission of ‘information’ that one anticipates today, but something much broader, and, in the highly moral world of the Middle Ages, the transfer of these broader qualities was of immense significance. All the senses operated by a form of touch, by direct contact. Sight, in the early Middle Ages, following Neoplatonic ideas, reworked by St Augustine, was considered to operate by a process known as extramission: a ray went out from the eye to the object and then returned to the eye. In the later Middle Ages, a view of the process based on intromission prevailed: what was seen resulted solely from light coming from the object. It passed through the air to the eye through a process known as the multiplication of species. These were images or representations of the original that brought the object and the eye together. One might imagine it much like a stick of Brighton rock: an image would appear in a cross-section taken at any point. These rays brought the perceiver and the perceived into direct physical contact. Much as I do not need to understand theoretical physics to believe that the world operates in a particular way, ordinary men and women of the Middle Ages did not need to grasp the detail of scholastic theories of perception and cognition. Yet there were close links between these theories and popular beliefs about the senses, and some striking aspects emerge from a consideration of perception in action. Holiness and evil, for example, were physical qualities that might pass by touch. Simply to look upon an object could bring advantage. In this way, the elevation of the host during Mass brought people benefit from seeing the consecrated bread; relics might be displayed in monstrances to the same end. Bad things could also be transmitted through sight: this was how the evil eye operated. Touch could bring a spiritual and a legal force. Pilgrims clustered at the burial places of saints – some tombs were even designed with apertures to allow visitors to climb inside, to get even closer to the holy. Swearing oaths while touching holy books guaranteed the truth of a jury’s verdict, its veredictum or ‘true saying’. Touch brought much more than cognition and symbolism. Transmitting moral and physical qualities was an essential part of sensation. We can see these qualities with other senses, too. Sound could be good or bad. It was the voice of the angel Gabriel that brought the Holy Spirit (and pregnancy) to the Virgin Mary, and illuminations show it passing into her body through her ear. Heresy passed by sound. One did not have to understand it to be infected, to hear evil sound was sufficient to pass the contagion. That’s why medieval listings of the senses sometimes include a sixth sense: speech. This might seem odd but to medieval people, speech was a part of the ‘senses of the mouth’: taste was the incoming aspect, speech – above all, an ethical act – the outgoing part. Traces of the moral characterisation of perception can still be found in present-day language and lore. One might talk about a good or an evil smell, or of ‘stinking sin’. And this reminds us that, although the scientific model of perception is a closed one, not everyone today sees the world in this way. Other beliefs run in parallel, and many have roots in the medieval past. What is the power of crystals, or of aromatherapy? Do ‘home-made’ foods bring with them more than the expertise of the cook, but part of the individual themselves? Medieval people were in fact unlike us in so very many ways: their senses brought them into direct contact with others, with the material world and the supernatural. And the consequences of that direct contact, through sight, hearing, smell, taste and, above all, touch, were an essential part of their lives. To medieval Londoners, the odours of Wyche’s execution site were confirmation of his moral qualities – whether for good or evil – qualities that they might themselves imbue on visiting the shrine.